The use of biofuels helps reduce human greenhouse gas emissions. That’s one reason why some petroleum companies offer petrol containing up to 10% ethanol (a biofuel). But if we are to have any real chance of avoiding catastrophic climate change, it is not enough to reduce our emissions; we must put the process into reverse. We must aim for “negative emissions”. This means removing carbon dioxide from the atmosphere, and ideally returning to pre-industrial atmospheric CO₂ levels. This is a daunting task: the present atmospheric concentration is 410 parts per million (ppm), compared with around 280ppm before the Industrial Revolution. Intriguingly, recent breakthroughs (see below) in biofuel research have brought this prospect a step closer. To understand why, we must first know a little about biofuel production. For years the petroleum industry has been producing biofuels, using food crops such as sugar cane, corn and soybeans, which are transformed by fermentation or other chemical processes into ethanol or biodiesel. This has been controversial, in part because of the negative consequences of large-scale monoculture farming of these crops. 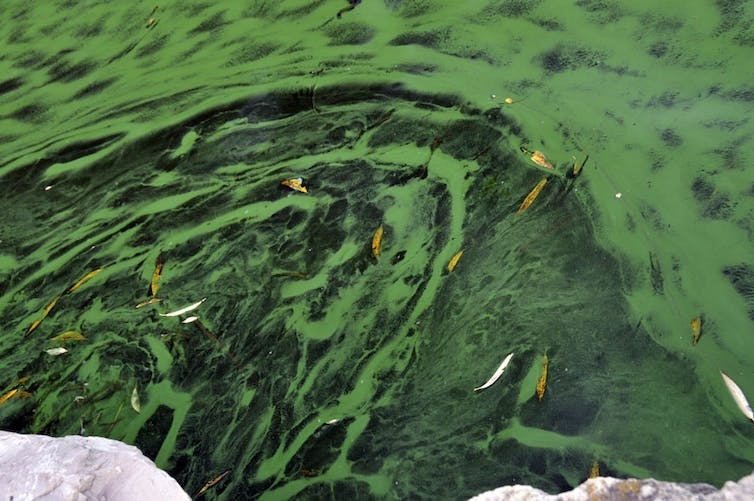 Accordingly, petroleum companies are now funding research programs on so-called second-generation biofuel crops – particularly algae, which can be grown in water rather than on land. This will circumvent many of the criticisms of first-generation biofuels. Algae come in many forms. Seaweed is a well-known form of macro-algae and there are also many micro-algae, such as the algal blooms that occur from time to time in polluted rivers and lakes. Algae are relatively inefficient at photosynthesising CO₂. But recent discoveries go some way towards solving this problem. Exxon-funded researchers have succeeded in genetically modifying algae so as to double the rate of carbon drawdown. Independently, a group of researchers at Washington State University has just discovered how to grow algae in days, rather than weeks, paving the way for more efficient biofuel production. If we can grow the right kind of algae, in sufficient quantities, the next step will be to convert it to biofuel. First-generation biofuel crops were rich in sugars and starch that could be transformed into fuels by processes such as fermentation. Algae cannot be transformed in this way. There is, however, another process that can be used: pyrolysis. If you heat biomass such as algae in the presence of oxygen, it burns, meaning that the carbon combines with oxygen from the air to form CO₂. However, if it is heated in the absence of oxygen, it cannot burn. What happens instead is that various oils and gases are driven off, leaving a relatively pure form of carbon, known as char or biochar. The process is known as pyrolysis and has been practised for thousands of years to turn wood to charcoal. Charcoal burns with particular intensity and historically was valued wherever very high temperatures were required, as in metal manufacture. The process is represented in the chart below. The gas, when burned, produces far more heat than is necessary to run the pyrolyser, and the excess can be used to generate electricity. Most importantly for the petroleum industry, the oils produced are easily refined into transport fuels. For this reason, petroleum companies are funding research on pyrolysis. Apart from burning with an intense heat, biochar has two other very important characteristics. First, it is a valued soil additive, and in fact is sold to agricultural users for this purpose. Second, when mixed into the soil it will survive for hundreds of years, perhaps even a millennium. Producing char and sequestering it in soil is therefore a semi-permanent way of capturing carbon. In contrast, forests are rather less permanent, because trees eventually die and rot, returning methane and carbon dioxide to the atmosphere; or burn, returning CO₂ to the atmosphere. Pyrolysis, then, offers the possibility long-term carbon sequestration - it is a route to negative emissions. 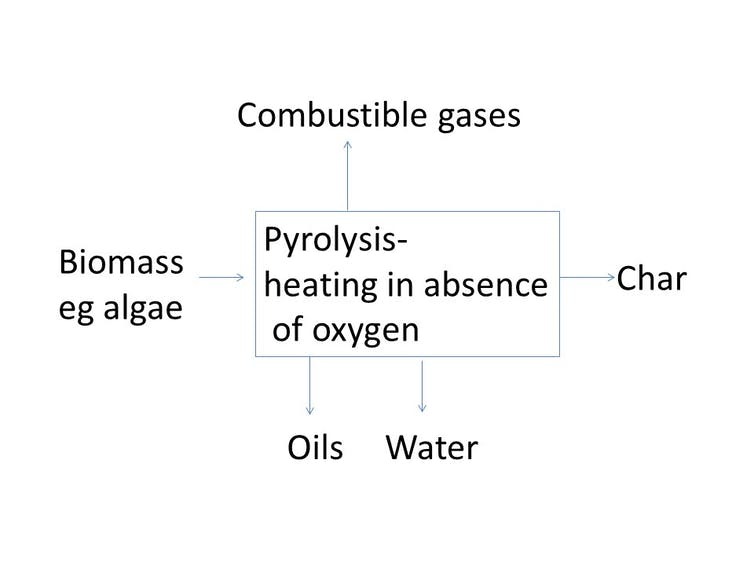 The last thing to note about pyrolysis is that by varying the parameters of the process such as the temperature and the type of algae, one can vary the relative proportions of outputs. In particular, one can maximise production of char, or alternatively, the production of oils to be used for transport fuels. Biofuel researchers are of course interested in maximising the latter, with char being to some extent an unwanted byproduct. However, if the pyrolysis of algae becomes a commercially viable way of producing biofuel, the char can be sold for soil enrichment. The result would be a steady stream - perhaps more realistically a trickle - of carbon returned to the soil. All this brings us tantalisingly close to large-scale char production, for its own sake. The very same research that delivers commercially viable second generation biofuels could presumably be redirected to maximise the yield of char. Biofuel would then be a byproduct, rather than the primary goal. Unfortunately, the market for char is not yet sufficiently developed to make this a commercial proposition. A significant price on carbon could change all this. If we are serious about achieving negative emissions, that may be the price we need to pay. And who knows, once the benefits of char as a soil additive becomes better established, the commercial value of char may be such that the a price on carbon will no longer be necessary. Could char production on a massive scale have unwanted side effects? We know that fresh biochar in the soil can deactivate herbicides rapidly leading to poor weed control. These results suggest that biochar use will need to be carefully managed in agricultural situations that rely on herbicides applied to the soil. The net agricultural benefits appear, however, to be overwhelming.